Amy Su 4d and Ge Liu 6d won the top table of Youth Adult Pair Go at the US Go Congress on Tuesday afternoon. Su is the daughter of Feng Yun 9P, and looks like she is becoming a strong player in her own right. Thirty-two players competed in the event this year, which included a few male/male pairs as well. The event often serves as a warm up for the regular Pair Go tourney on Thursday night, where pairs will compete for the right to represent the US at the World Pair Go Championships. 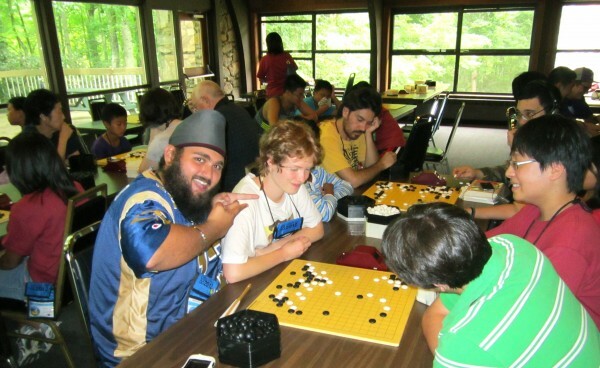 Youth Adult Pair Go is one of many events in the Youth Room, which features daily prize tourneys. Thursday’s events are relay Go and a 13×13 tourney, the Youth Team Tourney will be on Friday. Congress youth attendance has been increasing steadily, and 100 kids and teens are attending this year – almost a full quarter of registrations. Other Pair Go winers included: Kelsey Dyer 1d and Sam Zimmerman 5k; Melissa Zhang 1d and Jeff Horn 1d; Peter Zhang 5d and Julie Burrall 6k; Ethan Frank 6k and William Xu 4k; Jia Jia 7k and Winston Jen 8k, Erandi Lozano 15k and Phillip Brix 6k. Story/photo: Paul Barchilon, E-J Youth Editor. Photo: Sathya Anand 2k attributes the divine move to his partner Kalinda Fraser 8k, their opponents Ethan Frank 6k (front) and William Xu 4k (rear) were nonplussed and went on to win the game.